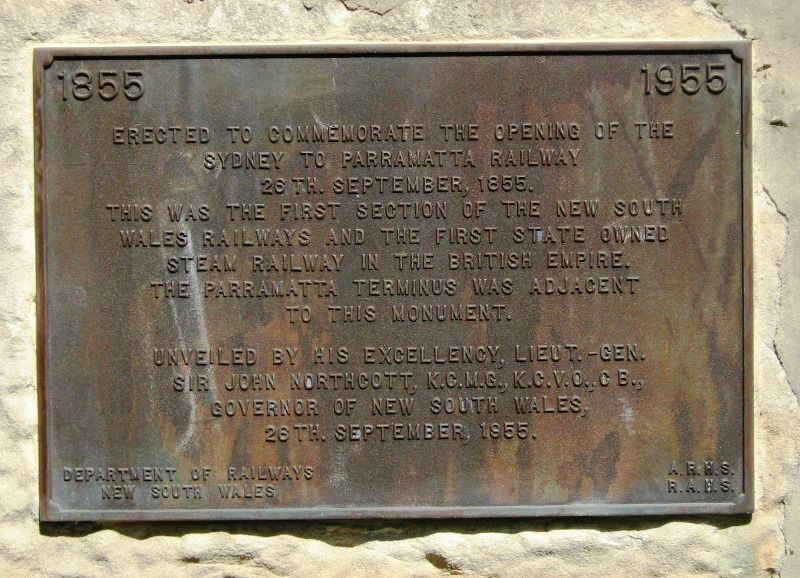 The monument commemorates the opening of the second railway line in Australia and the first in Sydney. In 1849, the Sydney Railway Company started building the first railway track in New South Wales between Sydney and Parramatta - a distance of 22 kilometres. The project ran into financial difficulty and was taken over by the New South Wales colonial government. The line opened on 26 September 1855. The station opened in 1860 as Parramatta Junction, and is close to the original terminus of the first railway line in New South Wales which was completed in 1855. THIS WAS THE FIRST SECTION OF THE NEW SOUTH WALES RAILWAYS AND THE FIRST STATE OWNED STEAM RAILWAY IN THE BRITISH EMPIRE. THE PARRAMATTA TERMINUS WAS ADJACENT TO THIS MONUMENT. This monument was erected by the Department of Railways. The stones are from the original Lewisham Viaduct completed in 1855, the first stone railway viaduct in Australia. 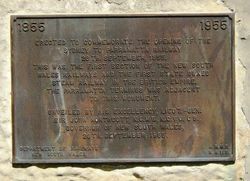 This tablet and the plaque, which is of metal originally used as Builders` nameplates on locomotives no longer in service, were presented by the Australian Railway Historical Society and the Royal Australian Historical Society.